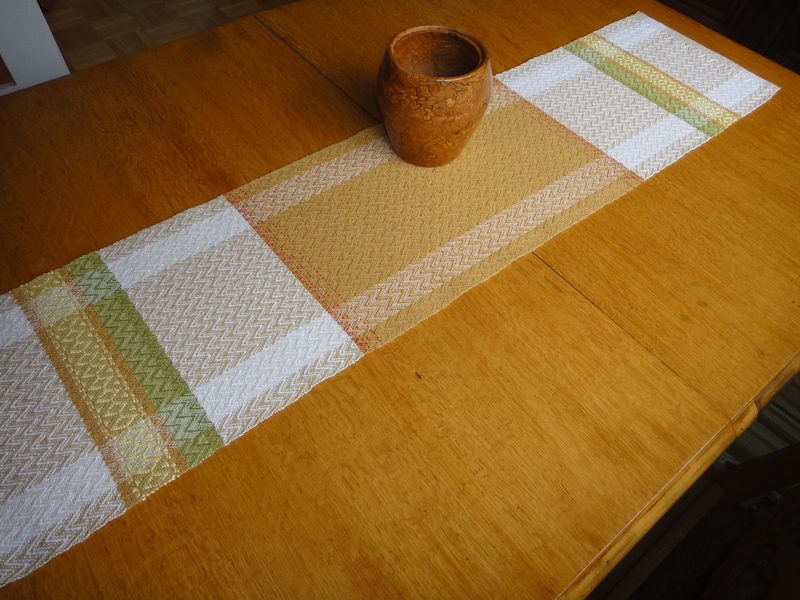 Design constraints included the palette of the pots, the muddying effect of my putty brown sample warp, the narrow weaving width, the colors of cottolin I had on hand, and the fact that I ran out of one color mid-weaving! 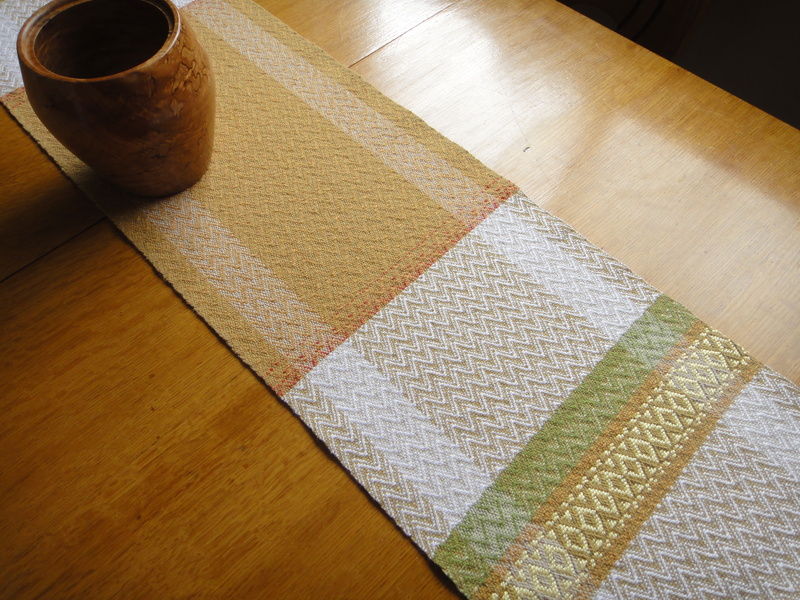 Still, I found it really engrossing to design something so far outside the scope of what I’d design to please myself–to the point that I actually grew rather fond of it in the weaving. Now my only beef are the proportions. The central ochre section was longer in my sketches. I ran out of that color four inches early; it shows. 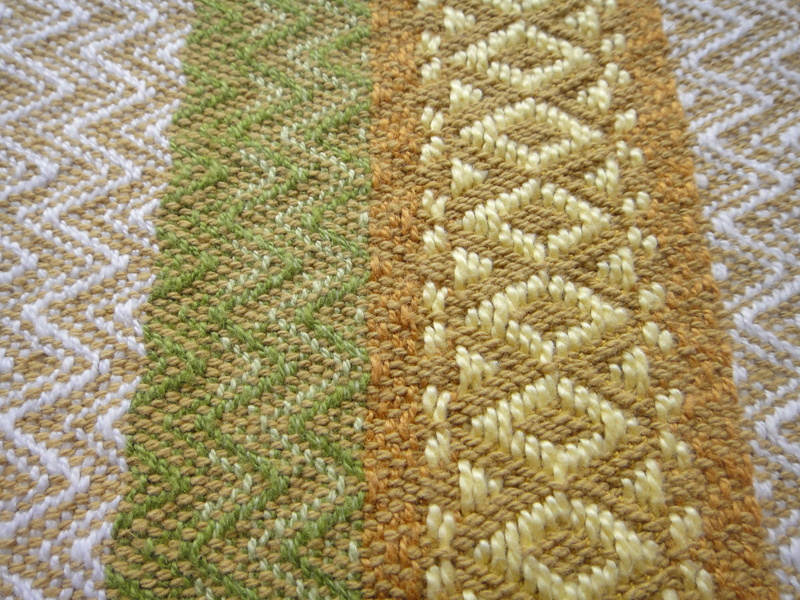 Threading: 8-shaft rosepath, 17 repeats plus balancer and selvedges. 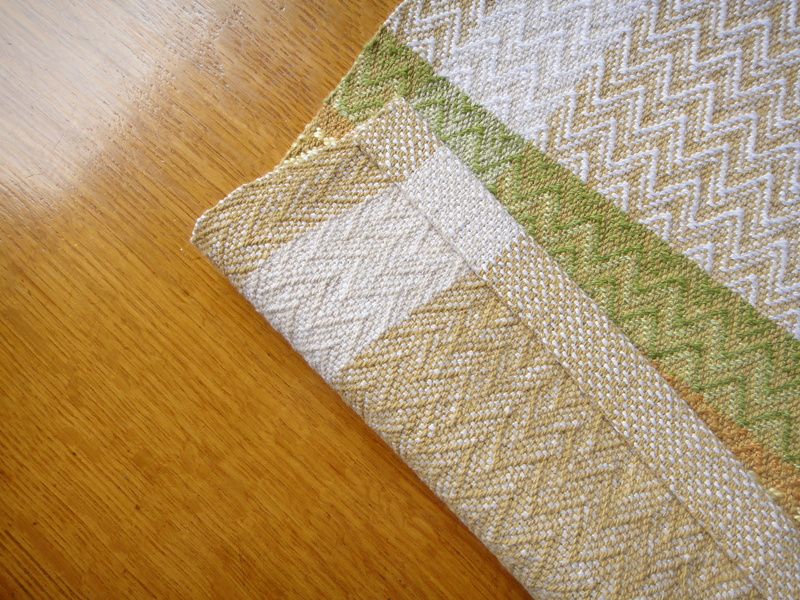 Pattern: Interleaved zig-zag twill from handweaving.net (draft #12247, reverse side up for slight weft dominance), with overshot motifs in borders adapted from handweaving.net #12408, and basket weave hems (or rather the closest you can get to basket weave in rosepath). 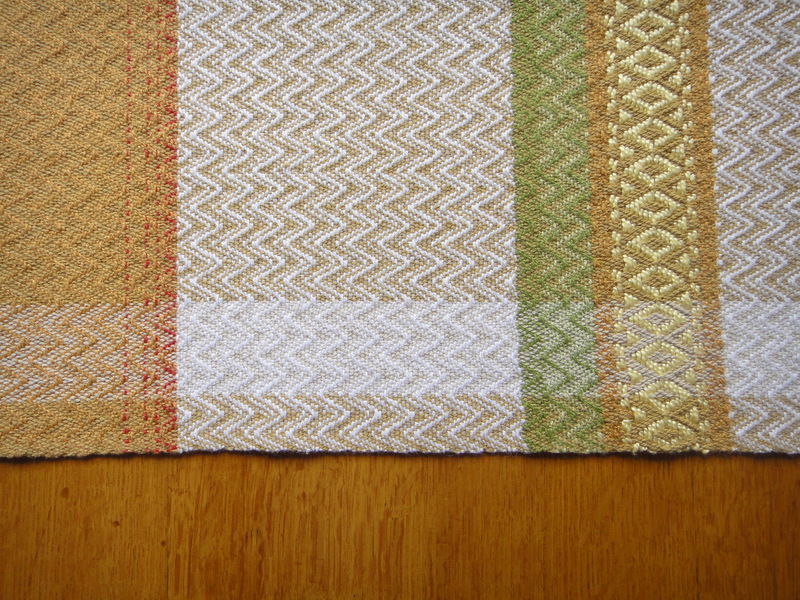 Weft: 22/2 cottolin (Borgs and Bockens: ochre, orangey red, turtle green; Louet: pastel green), white 8/2 cottolin from Pacific Wool and Fiber, 3/2 mercerized cotton in cornsilk yellow, and Lily size 20 perle cotton in light bronze (as tabby weft for overshot border motifs). Finishing: normal warm wash and tumble dry twice, remove from dryer while still slightly damp both times, hot iron, 3/4” slip-stitched hems. 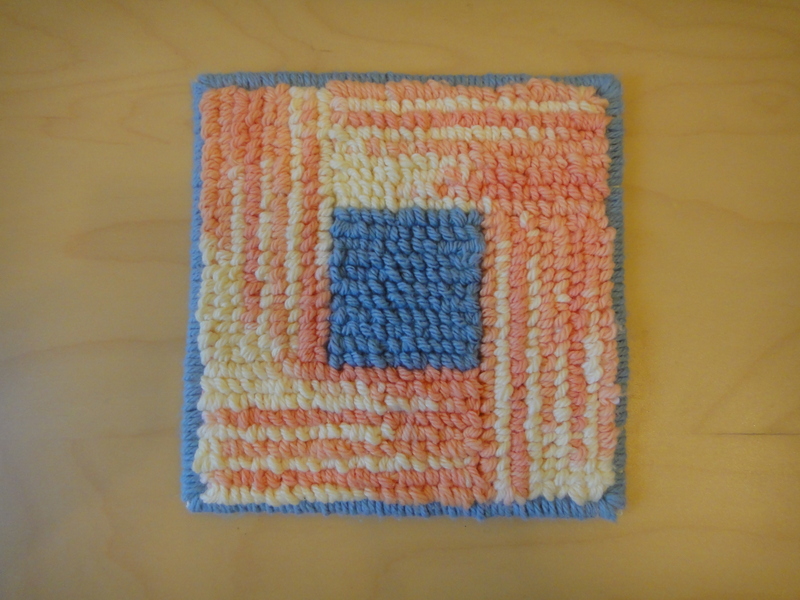 Conclusions: Close sett reduced draw-in, though it muted the weft colors a bit more than I wanted. 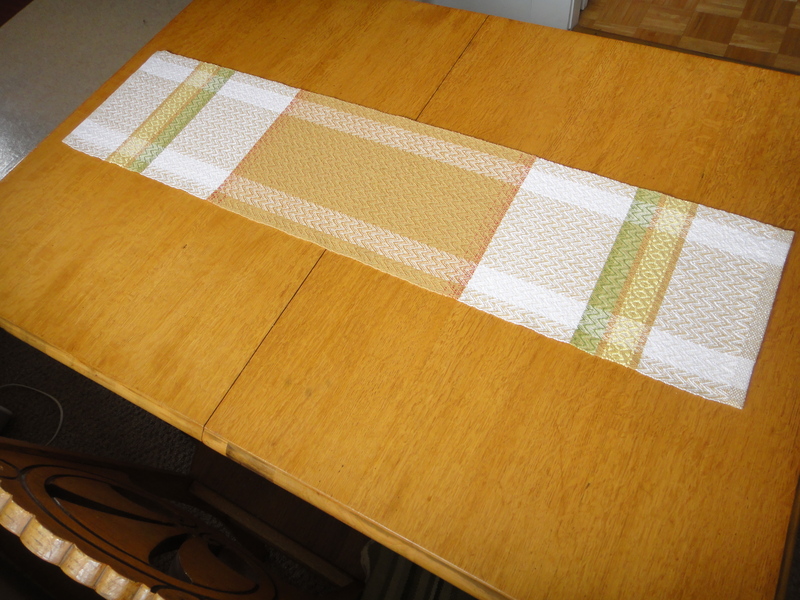 My beat was lighter for the first decorative border than the second, should have done more counting of ppi. 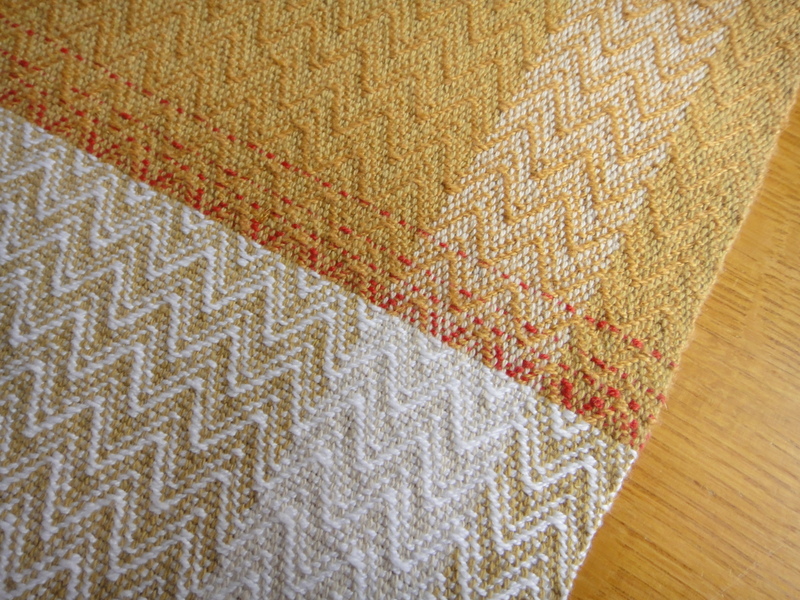 The overshot figures in the second border looked squashed after wet finishing. 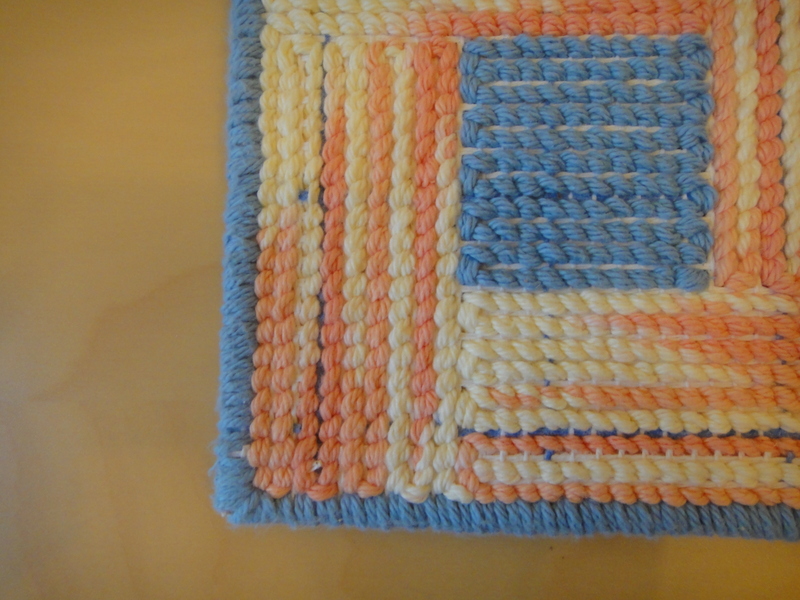 Modified basket weave worked well for hems, but they are too thick. Next time bind raw edge with seam binding and fold only once to hem?